Sustainable packaging is based on three key overall objectives: reduction of material use, employment of materials that are recyclable and reduction in energy use. Meeting these objectives requires a series of specific strategies including avoidance of plastics, use of adaptable and flexible production lines, embracing 100% monomaterial packaging, maximizing efficiencies throughout the packaging process and logistics chain and minimizing waste at every stage of the value chain. Dividella is able to support all of these strategies by providing highly flexible and adaptable modular packaging machinery and solutions. Dividella champions the adoption of 100% monomaterials packaging solutions to deliver better sustainable and environmental performance, reduction in waste, greater modularity and efficiency and overall delivery of reduced Total Cost of Ownership (TCO) and Total Cost of Package (TCP). The use of chiefly board, fiber and paper-based monomaterials also helps manufacturers meet the increasingly urgent imperative to become “plastics free” as part of their sustainability goals. The impact of monomaterial packaging is significant for the pharmaceutical industry, for whom the packaging and logistics chain accounts for the greatest consumption of plastics. The combined impact of such variables can reduce the TCP of, for example, a typical parenteral package by significant margins. 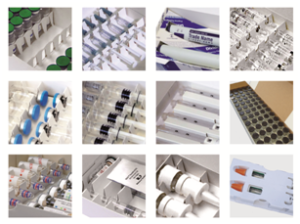 Replacing the ‘classic’ plastics-based blister pack of three syringes and pack insert in side-loading folding box with a 100% monomaterial folding box with glued corrugated flute, produced on toploading machine, can deliver savings of around 25% in box cost, around 70% in tray and total elimination of foil costs, more than halving overall cost of package from around 24 cents to around 10 cents. For an annual quantity of 2.5 million packs, total costs are reduced from $600,000 to around $250,000 for the monomaterials solution, producing recurring savings of $350,000 per annum in materials cost alone. However, the monomaterials solution delivers further savings across the value chain, extending from simplicity of manufacture to weight and volume savings in logistics. These, too, can be considerable, with a NeoTop monomaterials package taking up around half the volume required for a blister pack almost doubling the payload for a nine cubic meter refrigerated container from just over 12,000 packs to almost 21,000, reducing per pack shipping cost from almost 41 cents to under 25c. Monomaterial packaging savings extend into energy use during packaging, reducing demand for the high heating demanded for film forming and sealing in blister packs. Using the same parenteral syringe pack example, energy costs per shift total some $5,000 for a TopLoader processing monomaterial packs, compared with $12,000 for a blister pack process. The success of Dividella’s NeoTOP TopLoad cartoning machines is based on a holistic and modular approach that recognizes that machine and pack design go hand in hand. The TopLoading concept also recognizes that each pack deserves to be treated as a unique entity supported by optimized handling and a complete packaging design. Dividella’s packaging designers are accustomed to working in close co-operation with the customer to determine detailed specifications for individual packs and carton loading. Click on Dividella 100% monomaterial packaging for other information.